NGC1097 is a beautiful barred spiral galaxy in the southern constellation of Fornax about 50�million light years distant. In the image above, North is up and East is to the left, and the field is 22� x 22�. NGC 1097 has a supermassive black hole at its center estimated to be 100 million times the mass of our Sun. The elongated yellowish object near the northwest (upper right) corner of NGC 1097 is the satellite galaxy NGC 1097A. � NGC 1097B is the�pink, elongated object north and a bit west of the brightest star near the bottom of the image. 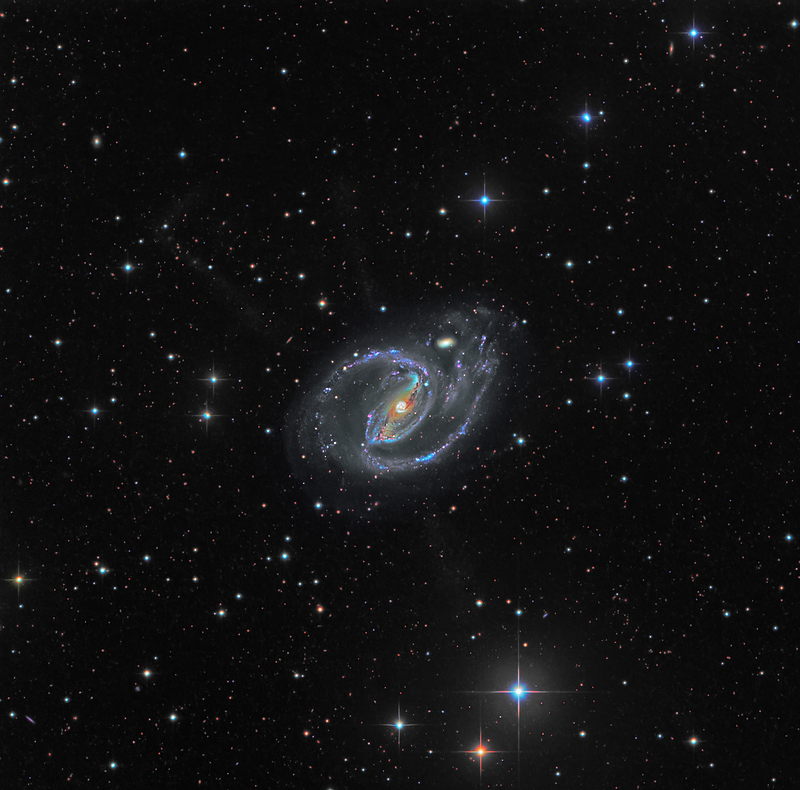 NGC1097 is referred to as a Seyfert galaxy, which means that it is an active galaxy with a very luminous core and a strong source of ultraviolet radiation. The spiral arms are filled with new star formation. Dark, reddish dust lanes are seen in the image rotating into the bright core which has some structure. There have been three supernova explosions in NGC 1097 since 1999. Most strange are several �jets� that appear to emanate from the core of the galaxy. Two are seen toward the northeast with the easternmost one turning nearly 90 degrees at its extent. There is a faint jet coming down below the galaxy toward the 3 bright stars in line with one of the upper jets. There is supposed to be a fourth jet below the galaxy, but it is not apparent in this image. All in all, a most unusual galaxy.